A Waterloo man is in jail, facing multiple theft charges in connection with a string of burglaries across northern and eastern Iowa. Chickasaw County Sheriff Marty Hemann credits the arrest of 35-year-old Jonathan Henry Martin to law officers from several cities and counties working together. “There’s been a lot of burglaries throughout the state, obviously they’ve not all been done by one person, but we’re just trying to tie together what might be related. 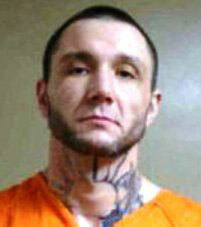 (Martin) was apprehended in Butler County,” Hemann said. After being arrested Sunday in connection with a break-in at a convenience store in Rudd, Martin was linked to other crimes across Cerro Gordo, Floyd, Chickasaw, and Fayette counties. Sheriff Hemann said one piece of evidence made it clear Martin was involved in all the burglaries for which he’s facing charges. “We had video surveillance of a vehicle that was consistent with what we were looking for, so I guess it was more-or-less a vehicle,” Hemann said. Most of the burglaries happened at businesses while they were closed, according to Hemann. Court records show Martin has served time in prison for burglary convictions. He was arrested three years ago this month following a break-in at a jewelry store in Hampton.